¿Por qué es importante tener un buen ambiente en el trabajo? ¿Por qué ayuda hacer pequeñas pausas con frecuencia en el trabajo para ser un trabajador más eficaz? ¿Cuáles son las distracciones principales en el trabajo? Mira el vídeo de abajo para practicar tu comprensión auditiva y escuchar mis respuestas a estas tres preguntas. Aprenderás nuevo vocabulario avanzado que puedes usar en tus clases de conversación via Skype con nuestros profesores nativos. Puedes ver el vocabulario clave de la lección debajo del vídeo y para aprender más, haz clic aquí y descarga el eBook – gratis. ¡Que disfrutes de la lección! E.g. A good work environment can create a positive impact on your business. E.g. Flexible working hours can help your team love what they do. E.g. My salary isn't especially high, but the perks are great, and include a flexible schedule, a company car and discounted meals. E.g. 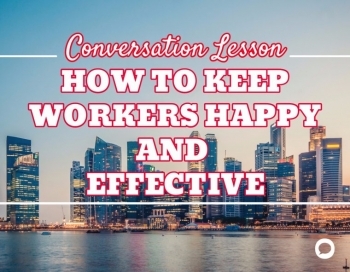 A happy workforce is a productive workforce. E.g. A lot of the best ideas come when you step away from your desk and enjoy a break. E.g. Going for a walk can help your thoughts and imagination run wild. E.g. Remember to take some breaks when you find yourself glued to your computer all day. E.g. Going on holiday is the best way to recharge your batteries. E.g. If you keep interrupting your work to check your email, it becomes a bit of a mess. E.g. We live in a culture where email overload is accepted. E.g. I empty my inbox every day before I have breakfast, and again before I go to bed. E.g. I got my first 9 to 5 when I was 24 years old.